I help out a little at Hawkin's Family Farm. I put my horticulture knowledge to work at their CSA in exchange for some chemical free fruits and veggies. This September I asked if I could pick some of their lovely grapes. 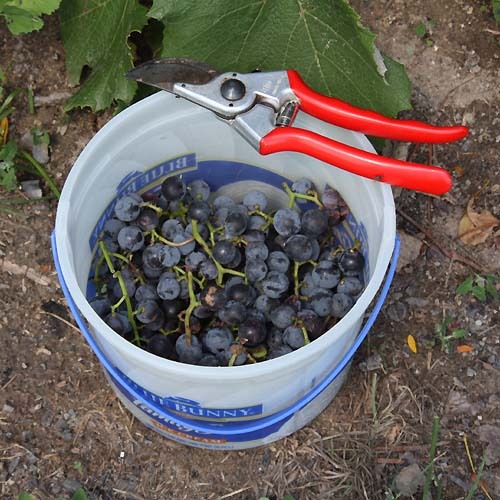 I used my trusty pair of Felco pruners to cut some clusters of grapes off the vine. I filled two ice-cream buckets full (6 pounds give or take) which some how gave me the exact amount of juice for two batches of jelly. 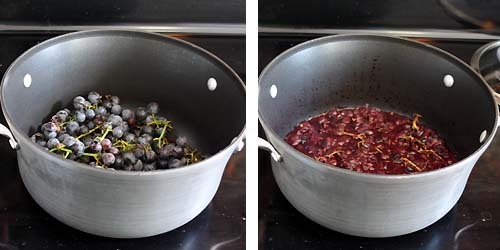 First I soaked all the grapes in my sink in enough water that they were submerged. All the little bugs living in there had to come up for air and I used a strainer to skim them off and dump them outside. 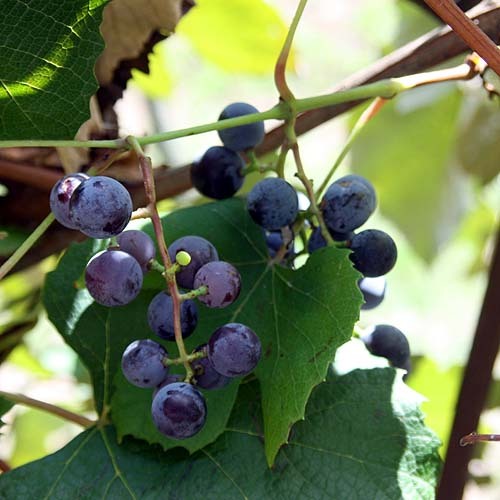 I also removed any leaves and twigs as well as any grapes that had fungus or disease. It was a dry summer so they were pretty darn clean. I don't have a very big pot, so I did two batches in my 8-quart pan. I threw the cleaned grapes, stems and all, in with 1.5 cups of water. I don't bother to crush the grapes. The boiling will release their juices. Above you can see on the left that's how the grapes started out and then on the right is after 20 minutes simmering covered. I've also used a strainer over a measuring cup. I've heard of folks straining out juice through cheese cloth. My mom used to put them in a pillowcase and hang them from a branch in the back yard for the afternoon. 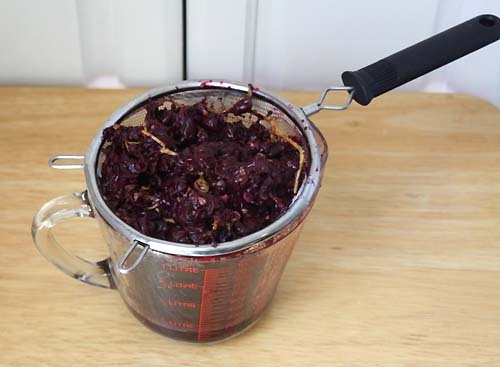 Then I used the recipe in the Sure-Jell box to make grape jelly. Here's the link in case you're interested. I just realized that Sure-Jell is a Kraft company. *Sigh*, I prefer not to buy from Kraft. Guess I'll have to get my pectin from some other source next time. My family makes jelly from wild grapes too. 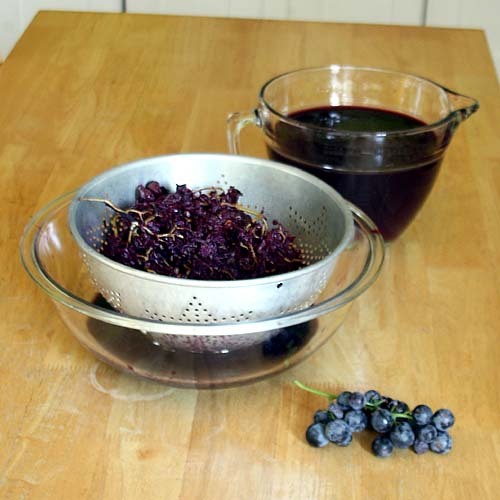 If you're interested here's that link: Making Wild Grape Jelly. 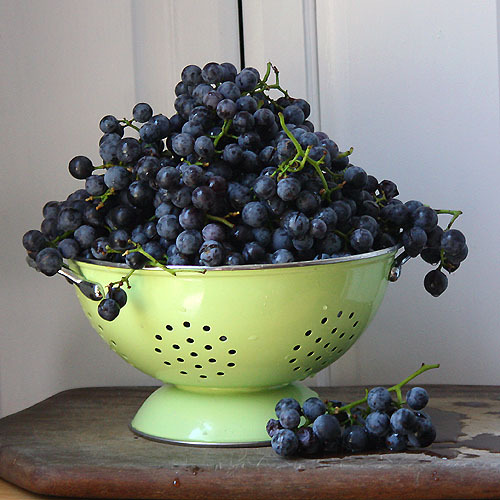 Do you have any tips for juicing grapes for jelly? I bet that taste amazing! How yummy! A coworker just gave me some lovely fresh grapes from her backyard. Not enough to make jelly out of, but oh so delicious to eat! I'd love to have my own grapes with enough to eat and make jelly too! They are such a treat. We did grape jelly last year and it was wonderful. The juicing was a pain though. On the other hand, last fall we went to a local winery grape stomp contest, which was loads of fun. I wonder how that works. You'd think stomping would make for cloudy juice. Perhaps they strain it afterwards? I had never heard of a steamer juicer until I moved here. Now I have two! We are making gallons of plum, apple and pear juice this week. I toss in the fruit and it does all the rest leaving me with perfectly clear yummy juice! I'd never heard of a steamer juicer either! Interesting. 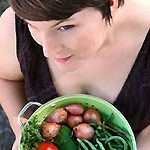 Where is it you moved that it's a common kitchen implement? Stopping by from the Living Green Link up. Pinning this for future use, thanks for sharing New follower, would love to have your posts come straight to my email, but not seeing a button. I think I could figure out how to do a subscribe button for my blog. It's good to know someone is interested. Thank you for this technique. Every so often I crave grape. But I'm the only one in the family that likes it. This looks like just enough. I'm interested to know why you don't buy from Kraft. I just don't like most of their products. For some reason it never occurred to me that I could make homemade grape jelly. Bet my husband would love that! I'm still trying to get up the nerve to make my first batch of strawberry jam. Strawberry jam is an excellent place to start. Once the home food preservation bug has bitten though, watch out! I've tried lots of things that fail. For instance I threw my first attempt at sauerkraut to the pigs after I saw fruit fly larva growing around the ring! We make a lot of Jelly and Jam every Spring and Summer, and we love using the fresh juice from the fresh fruit. Great idea's. Hope you have a great weekend and thank you so much for sharing on Full Plate Thursday. Goodness that looks yummy!! 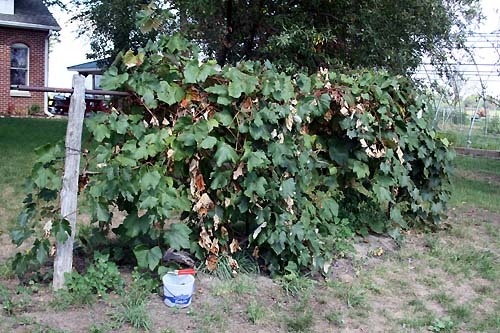 We used to grow grapes on our old property, but they didn't make it when we tried to transfer them here. Very useful info though! Thanks for linking up to Snacktime Saturday! Your Grape Jelly looks amazing. It would be so lovely made from such fresh grapes, and so truly from scratch! Thank you for sharing this excellent tutorial with us at Hearth and Soul. I had a bunch of green grapes and they were tiny with 2 seeds each! I'm sure this would work for those too. How come you don't see green grape jelly? Or have I just never seen it. I bet it is really pretty spread on bread. When I saw Hawkins Family Farm I knew you were in my neck of the woods! I used to have one of their photos for my desktop wallpaper! Grapes are great around here as is most everything else. But we are moving to Indy:( Goodbye to the clop clop of horses hooves on the roadways. I wish you guys were staying near by. I need more garden friends!